Our apartment is the top 2 floors of a 4 storey building which comprises only 6 apartments. There are balconies to the front of the property with spectacular sea, village and mountain views. There are also 2 private terraces to the rear of the apartment. The apartment building is located at the end of a very quiet street and has neighbours to one side only. The apartment overlooks the pretty village of Kas which is a mere 10 minutes stroll away where there are plenty of restaurants and bars. It is also only a 5 minute walk to the water’s edge below where sunloungers are located at various beach platforms. My name is Penny and I am Australian. My husband, Kev, is Welsh. We have been married for 30 years and have lived mostly in Australia but since 2000 have lived in Europe. We bought our lovely home in Kas in 2004 whilst we were living and working in Jersey. In 2005 we decided to have a "gap year" and live in our house in Turkey. We loved it so much we decided to retire and live here permanently. We still travel a lot and usually spend the summer months travelling so have decided to rent out our home from June to October. Kas is a beautiful place and everybody who comes here falls in love with it - and I am sure you will too! We came to Kas on holiday in 2004 after researching the best places to stay in this part of Turkey. We were amazed at how beautiful it was and bought our house whilst we were here. Kas is a pretty fishing village which hasn't lost its quaint charm even though it is very popular with tourists. It is small but has plenty of lovely restaurants and bars all within easy walking distance from our home. One of the main reasons why we bought our house is the view which is spectacular. We look out over the bay to the mountains on the left and across to the Greek Island of Kastellorizo in front and over to Kas Harbour and village to the right. Many happy hours are spent on the balcony watching the world go by! The view of course is the main benefit, but our house is also only a 10 minute walk into town and a 5 minute walk down to the beach platforms below. We are at the end of a very quiet street with uninterrupted views. Downstairs bathroom has shower and wc. Upstairs bathroom has shower over bath and wc. Notes on accommodation: This is a non smoking apartment. Outside: There is a garden terrace at the rear of the apartment which includes some gym equipment and a BBQ. There is a balcony leading off the lounge area with outdoor furniture for 6 people. There is also a balcony off Bedroom 3 upstairs and a large, private, wraparound terrace leading off Bedroom 2. Cleaning / Towels / Linen / Maid service: Towels and linen are included. The property is not cleaned during a holiday let unless requested and this would be at an extra cost. This is a lovely apartment with a fabulous view (106 steps up to it notwithstanding) of a wonderfully picturesque and atmospheric Turkish seaside resort. Not only a worthwhile destination in itself but a great base for other activities such as visiting the mountains, canoeing, kayaking and so on. Took a couple if days to suss out how to get the best out of the aircon but otherwise absolutely spot on. Our kids (aged 11 & 7) both loved it. We stayed at this apartment for two weeks and had a great holiday, the views from this place are amazing and it's just a short walk into Kaş itself where there are many good restaurants and shops. The apartment is spacious and has everything one could need. Plenty of space for parking if you hire a car (we didn't). The steep streets and steps up to the apartment may be a challenge to the unfit but taxis are also cheap from the town - but the views are well worth the effort! Tolle Wohnung und Aufteilung mit den Schlafräumen, ein wunderschöner Blick über die Bucht beim Frühstück auf der Terrasse und abends über die Stadt. Sehr ruhige Lage und haben super geschlafen. Mit einem Mietroller hatten wir einen idealen Ausgangspunkt für unsere Aktivitäten. Wir kommen nächstes Jahr wieder. Beach platforms are located just beneath the apartment, just 5 minutes walk down the hill. There are several beaches located nearby, about 20-30 mins walk or a 5 minute drive away. The famous Kaputas Beach is 20 mins drive away and Patara about 40 mins drive. The nearest airport is Dalaman and is approximately 2 hours drive away, the next closest is Antalya, about 3 hours drive. An airport pickup and/or hire car can be arranged. A hire car is not essential as you can walk to restaurants, bars and beaches but if you wish to travel further affield a hire car would be useful. The nearest village is Kas, 10 mins walk. The next nearest village is Kalkan, a 25 min drive. Kaputas Beach is 20 mins drive and Patara 40 mins. There is a small grocery shop selling bread, milk and cold drinks just down the hill from the apartment. There are 4 good sized supermarkets located in Kas itself, the cheapest of which is BIM but the most convenient is MIGROS because it sells fruit & veg as well as meat so one stop shopping can be achieved. There are many banks in Kas with ATMs. 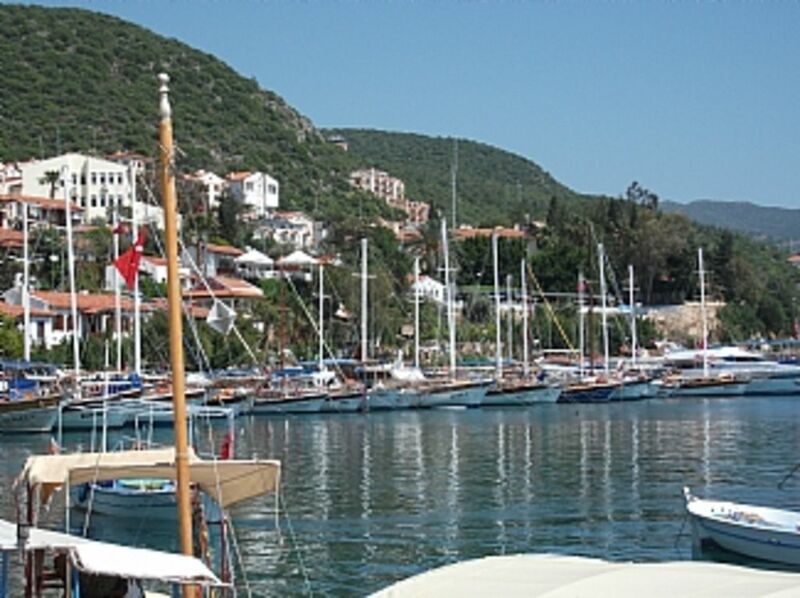 There are many restaurants in Kas, all of which serve good quality Turkish food. The most popular leisure activities are scuba diving and paragliding. Booking Notes: A 25% deposit is required to secure the booking and final balance is due 6 weeks before the commencement of the holiday. Bank details for transfer of funds will be supplied when a booking is requested. Changeover Day: Changeover day, arrival and departure times are flexible.